We will be doing enrolments on 14-15th May for children turning five in 2019 and 2020. If your child is turning five in 2019 or 2020 please contact me to organise a time. I am happy to have a conversation with any of your family or friends to determine whether they would be eligible for a place at St Joseph's. 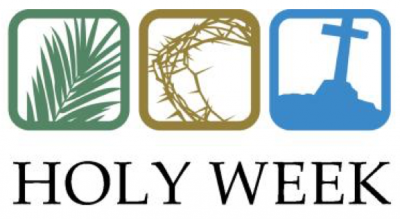 This year Holy Week falls in the school holidays and we are celebrating it through the week this week. We started today with junior hub one leading us in mass with Palm Sunday. This is remembering Jesus's triumphant arrival in Jerusalem where he was hailed by the crowds as the King. Four days later He celebrated the Last Supper with his disciples where he instituted Eucharist and also washed the feet of his disciples showing that he was their servant as well as their king. We remember this on Friday at 10am in the hall led by Mrs Winders and year 4/5. We end the week with stations of the cross led by the Year 8s. The children will follow the stations and so this year we are doing it in two parts. The juniors will do the stations first at 2pm followed by the seniors at 2.30pm. Parents, family and friends are encouraged to join us for the 2.30pm celebration after which we will leave quietly. There will be no celebration assembly this week. This Friday is a mufti day. Please bring a gold coin for Caritas. Our children have been learning about the plight of children in South Sudan which is the Caritas focus for Lent this year and funds raised will go to this. It's great to see so many children enjoying our school library. Our year 8s are making good use of it during the lunchtimes as part of their leadership work using it as a library and encouraging a love of reading in their fellow students, and for chess club. Please try and find time over the holidays to investigate our public library and encourage your children of all ages to continue reading through the holidays. A big shout out to our budding musicians. We have had a group of drummers and ukelele players who have exemplified learning this term. They have had some basic tuition and ongoing support and then have put in a lot more time themselves, practising and teaching each other. Thank you to Hana Davies who is leading our ukelele group and has provided a lot of support and guidance for our young musicians. On Monday the staff investigated our school grounds. We acknowledged what is good, what is not so good and brainstormed some dreams about what we would like to happen. The children and parents will also be involved in the same process next term. Our focus this year and beyond is on authentic learning. That means we are using real contexts such as projects about our environment to teach our essential learning across the curriculum - literacy (reading and writing), maths, science, social studies, health and physical education, the arts, technology and of course Religious Education. On behalf of the staff of St Joseph's I wish all families a safe and happy holiday. Enjoy some well-earned rest and we look forward to another exciting term of learning next term. We celebrate Palm Sunday by listening to the story of Jesus coming into Jerusalem. JH1 talk about the story when presenting the gospel on Thursday at Mass. We talk about the story and wave palms just like the people did in Jerusalem and we praise and shout with joy. "Hosanna, Hosanna to the King!" Displeased, the Pharisees tried to silence the disciples. But Jesus said that even if the people were quiet, the stones would cry out his praise instead. Living in Harmony with God's Creation. All powerful God, you are present in the universe and in the smallest of your creatures. You embrace with your tenderness all that exists. Pour out upon us the power of your love, that we may protect life and beauty. Fill us with your peace, that we may live as brothers and sisters, harming no one. O God of the poor, help us to rescue the abandoned and forgotten of this earth, so precious in your eyes. Bring healing to our lives, that we may protect the world and not prey on it, that we may sow beauty, not pollution and destruction. Touch the hearts of those who look only for gain at the expense of the poor and the earth. Teach us to discover the worth of each thing, to be filled with awe and contemplation, to recognise that we are profoundly united with every creature as we journey towards your infinite light. We thank you for being with us each day. Encourage us, we pray, in our struggle, for justice, love and peace. 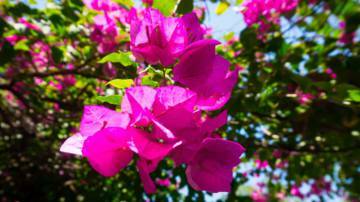 It is for all who believe in God who is the all-powerful Creator. Parish Freezer - Years 6 and 7 - we would be very grateful if the families could kindly donate baking or cooked meal items during term 2 for the Parish Freezer. The items can be baking or a main meal e.g. soups, casseroles, lasagna, muffins, biscuits etc. A notice will come out next term. Pies and Milo - Every Wednesday starting May 1st, you can bring a pie for lunch wrapped in tin foil with your name clearly marked. If you want a hot Milo drink with your lunch, bring your own named cup and 50 cents. Please take the pies and cups to the hall kitchen first thing in the morning when you come to school. At lunch time, go to the hall and collect your pie and milo. We are holding a mufti day tomorrow to help raise funds for Caritas. Please bring a gold coin donation for this cause. 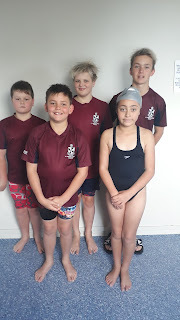 Congratulations to our 5 swimmers who competed at these swimming sports last Saturday. A lot of schools from around the Otago region compete at this competition and our children achieved some really good results in their age groups. - Levi Heffernan - 1st in 50 freestyle and backstroke and 2nd in 50 breaststroke and also broke the Otago Primary school records for 50 free and 50 back. Well done Levi. - Eva Fatafehi and Stirling Heffernan who are both 8 years old competed in the U9 age group and swam very well for their first swim competition. The Uniform Shop will be open on Monday 29th April at 8.30 am for winter uniform and sports socks. The winter uniform is to be worn next term without ties. Ties are NOT to be worn on a day to day option but are to be kept for formal school occasions. The skorts are now available at The Warehouse and the arrival of the thicker polar fleece jersey will be notified when they arrive. All sports fees have to be paid or a payment plan in place before Saturday 11th May as some parents have opted to wait until sport teams were named before making payments. If you have any difficulty with the fees this year, please contact the principal. Sports Uniforms will be handed out once fees have been paid or a payment plan in place. The uniforms will be handed out in week 1 of term 2 as well as gear bags for coaches. Netball players have received their uniforms this week because they play this Saturday. Netball coaches for Yr 5-8 will get their gear bags tomorrow and the Yr 3/4 team in week 1 of term 2. This week all coaches will be given their contact details of their teams and will be in touch with their teams directly. Each sports team will have their contact details emailed to them as well. Fees - some sport associations have increased their fees in which we have to increase our fees e.g. basketball and netball. Sports team lists as of today are on another page in the blog. All fees include the $5.00 uniform hire and need to be paid before the start of winter sport commences in term 2. Uniforms will not be given out unless some payment plan has been put in place and payments have started. This year some codes are being charged per player and not per team so our school will be invoiced for each player. Please note if you pull out of a team once the competition starts either due to injury or not wanting to play, you will still be charged for the sports fee. Basketball - $67.00 per player, an increase of $7.00. This is because referees are now being paid which saves parents and coaches having to referee. Football - $40 per player for midget grade, no increase. Hockey - no uniform hire is included in these fees as our players have joined with other schools. The Funsticks fee for Yrs 1 & 2 is $25.00 per player which includes turf fees. The other grades will be invoiced by the school the children are playing for. Miniball - $57.00 per player, an increase of $7.00. This is because referees are now being paid which saves parents and coaches having to referee. Score bench - a roster system will be set up for all players in each team to do score bench duties. This will come out in week 1 of term 2. You will be required to do at least 1-2 duties each. Due to the referees being paid this year, no teams will have to referee. The boys basketball team combinations may change when they have had their practices as one team has extra players than the other. The Midget programme will be running on Friday afternoons from 4.00 to 4.45 pm at the North Otago Showgrounds. The First Kicks programme will start on Friday 10th May. It is largely based around the same format as last year. A fun rotation based learning environment with lots of opportunity with the ball. Every so many weeks, there will be a game day. Players will need their club uniforms, shin pads and a drink bottle. Yr 1/2 Fun sticks grade - you need to bring sport shoes and water as everything else is supplied. Please meet at the hockey pavilion at 3.45 on Wednesday 8th May. Mouthguards are compulsory for all teams and rugby socks can be purchased from our Uniform Shop for $15 each. Our new rugby jerseys have arrived and they will be distributed out next term. Players registration link - I will send the rugby registration link out tomorrow for players to register. There was a JAB meeting last night and this information has come from it. 5 year and 6 year old rugby teams will combine this year and your practices will be on Friday afternoons from 3.15 to 3.45 pm. Coaches please liaise with each other to see what you would like to do. 9/10 and 11/12 teams - in these grade all clubs are really tight on numbers and most are playing with the bare minimum of players. At this stage these teams are not combining with other clubs and will play with their numbers. We are looking for more players in these two age groups. The annual Pompallier Trophy will be held on Sunday 19th May in Ashburton. This is a 10 aside tournament played against Catholic Clubs from Christchurch, Ashburton, Timaru and Oamaru and involves rugby games, sprint races and a tug of war competition. The grades are Under 9, Under 11 and Under 13. Can all players confirm with your coach if you are available to attend on this day. Lunch is supplied and there is no cost involved apart from petrol costs as we car pool. Small Blacks Coaching Course - there are 2 courses for this. If you are coaching a team this year, please ensure you have been to one of these courses. The first course is Wednesday 17th April at the top pub in Kurow at 7.00 pm. The second is Sunday 28th April at Excelsior at 10.00 am. This should run for 1- 1/2 hours. Girls Grade - any girls wanting to play but not keen to play in a mixed grade, this is for them. It is for years 7/8 and above. Looking at possibly a Friday afternoon for this. Contact Mrs Brien if interested. Holiday Programme - There is an upskills programme on Wednesday 17th April and Wednesday 24th April for age groups 9/10 and 11/12. Start time is 10.00 am and finish at lunch time. Please contact North Otago Rugby Union if you are interested in going. Small Ferns to Black Ferns Holiday Camps being held in Monday 15th April at St Kevin's College. Junior/primary girls register 8.30 to 9.00 and the camp is from 9.00 am to 12.00 pm. Netball starts for Yrs 5-8 this weekend and Yrs 1-4 start on Saturday 4th May. Millers Flat Trail Ride - fundraiser for the Millers Flat School on Sunday 14th April. For enquiries phone Rob McQueen on 021 64559 or Kaye McCurdy on 027 913 2537. NZ Authors visit Oamaru Library - as part of the Storylines National Festival Tour. Mandy Hager, Suzanne Main, Toby Morris and Jenny Cooper will share their ideas on how we can encourage children to be more engaged readers. Held at the Oamaru Library on Wednesday 15th May from 6.00 to 7.00 pm. St Francis Xavier School 100th Centenary - held Labour Weekend 25th - 26th October. Calling all past and present pupils, families and teachers - come and celebrate 100 years of our fantastic school community. Find us on Facebook St Francis Xavier School Centenary Labour Weekend or email reunion@stfrancissavier.school.nz or phone the school office on 03 453 4446. Skills Start: Saturday 4th May at 10.00 am.